Hello, beauties stay spooky 🖤 🦇 I have a ton of great Black Friday deals in store for you this is one of many posts. This post will pertain particularly to Sugarpill. Hello, beauties stay spooky 🖤 🦇 I have a ton of great Black Friday deals in store for you this is one of many posts. 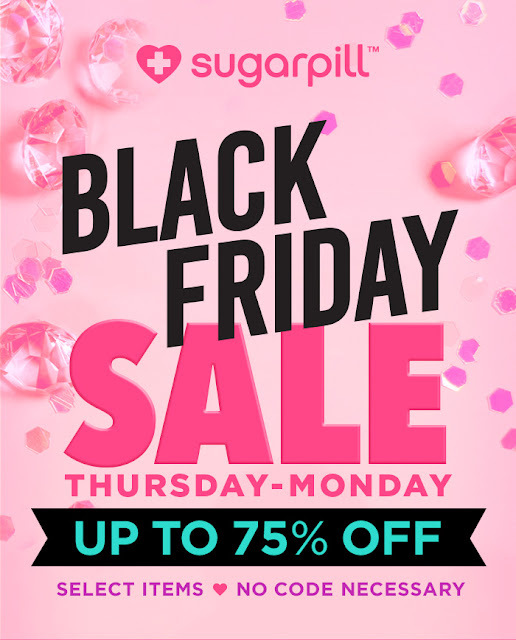 This post will pertain particularly to BEAUTY BAY is having some amazing sales for Black Friday in case you missed it. They're having 30% Off Palettes, Skincare, Jeffree Star, Mario Badescu, The Ordinary, Makeup Revolution and many more! Hello, beauties stay spooky 🖤 🦇 I have a ton of great Black Friday deals in store for you this is one of many posts. This post will pertain particularly to Ulta Beauty. You will get FREE Shipping on any order over $35. 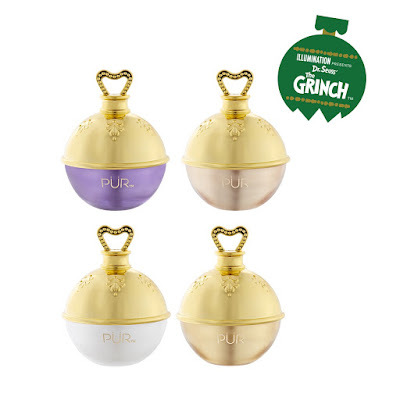 Hello, beauties stay spooky today I have some exciting news for you all a hot new collection from Pur Cosmetics just launched The Grinch! What it is: Illumination Presents Dr. Seuss' The Grinch™ Good Enough to Steal is a 12-Piece Collector's Face Palette & Color-Changing Lip Balm Set with good-for-your-skin ingredients. A $198 Value! What it does: Explore limitless makeup possibilities in this festive 12-Piece Collector's Face Palette & Color-Changing Lip Balm Set. 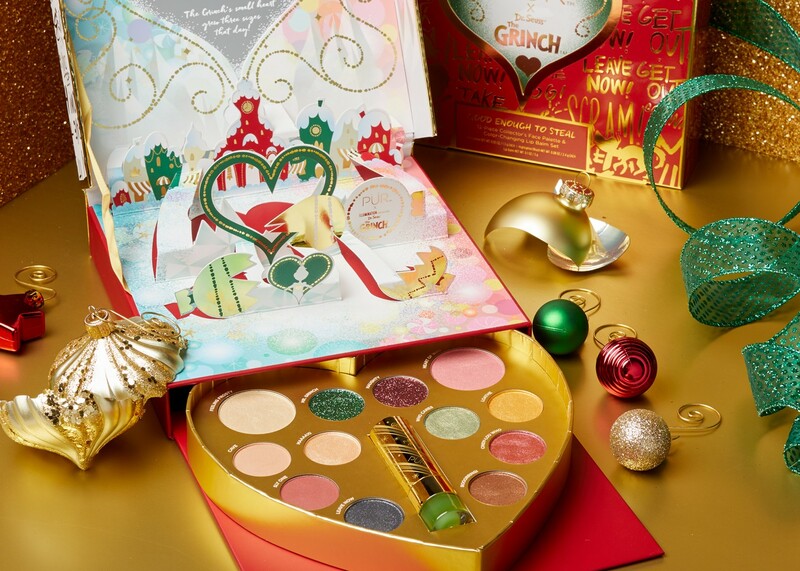 Inspired by Illumination’s sweeping new version of Dr. Seuss' The Grinch™ this eye-catching, multi-use makeup palette and set of 10 silky smooth eyeshadows, a light-catching highlighter, rosy blush, and color-changing lip balm make it easy to change your makeup look whenever you change your mind. Show off your holiday cheer and sparkle with a cheeky, radiant glow and a pop of color… it’s easy with the included Feeling Frosty Highlighter and Heart of a Who Blush. Create endless eye looks that stay luxe with the 10-piece highly pigmented eyeshadow palette in an assortment of festive, on-trend matte, shimmer and glitter shades that can transition from everyday gorgeous into mischievous night looks that wow. Don't be fooled by the ultra-moisturizing, color-changing, lip-pampering Moody Lip Balm as it appears Grinch-green but magically transforms to the perfect shade of pink once it touches lips—it's PÜR makeup magic. 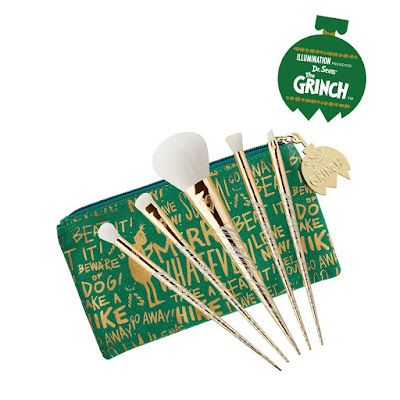 What it is: Illumination Presents Dr. Seuss' The Grinch™ He Hates It, You'll Love It—a festive 5-Piece Cruelty-Free Brush Set designed for flawless makeup application. A $121 Value! What it does: Be your own storyteller this Holiday season with this festive 5-piece Cruelty-Free Brush set. Inspired by Illumination’s sweeping new version of Dr. Seuss' The Grinch™, this travel-friendly makeup brush set was designed to cover every beauty application need, flawlessly—apply all your favorite cosmetics with flair. Let your favorite features stand out or choose to conceal, this exclusive makeup brush collection features 5 quality, cruelty-free makeup brushes that are designed for precise, easy application of powder, foundation, concealer, eyeshadow, and eyeliner. Take your holiday glam from innocent, daytime looks to dramatic, mischievous looks with this compact, celebratory makeup brush set with unique, gold-swirl handles for a fun look with precise application. On-the-go this holiday season? The 5pc brush set includes a festive, travel-friendly zip pouch for quick touch-ups wherever you go. 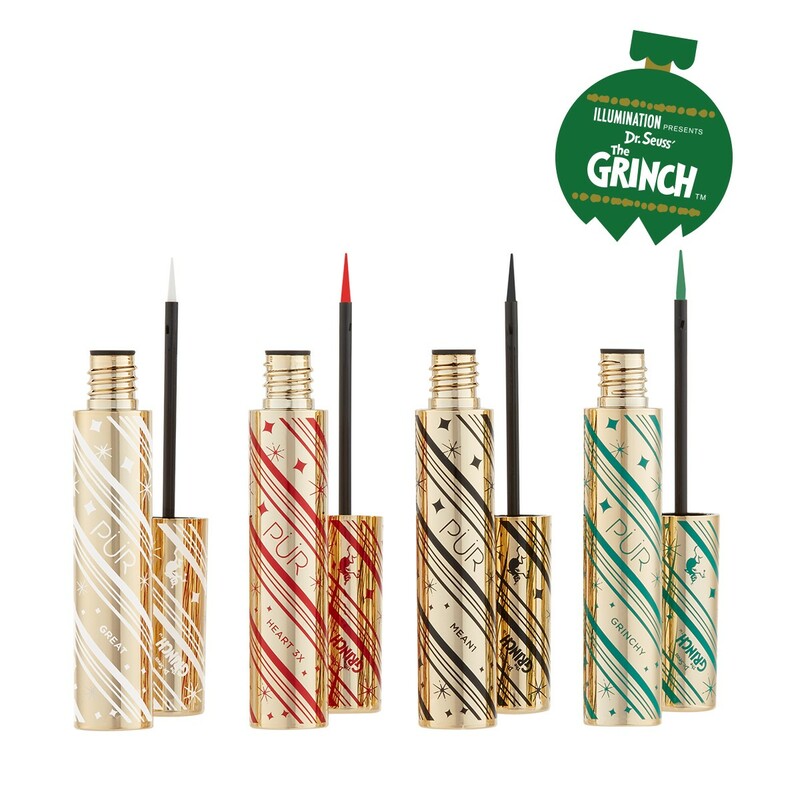 What it is: Illumination Presents Dr. Seuss' The Grinch™ Heart Line is a festive, highly pigmented 4-Piece Eyeliner Set with good-for-your-skin ingredients. What it does: Experiment with bold shades and open your eyes to a world of possibilities with these four colorful Heart Line liquid eyeliners that will liven up your eyes with versatile thin to thick, classic to winged looks—just in time for the holiday season! Inspired by Illumination’s sweeping new version of Dr. Seuss' The Grinch™, this festive 4-Piece Liquid Eyeliner Set comes in 4 bold shades (green, white, red and black), each formulated with skin-soothing Vitamin E. An eyeliner that’s also good for your skin—it’s eye-opening! Highly pigmented for intense color release, these versatile, fragrance-free liquid eyeliners are heavy on performance as they glide on smoothly with ease, gently defining each eye with smudge-free precision. The ultra-thin brush-tip allows maximum control for crisp, foolproof application. Whether you go with Grinchy Green, Heart 3x Red, Mean1 Black or Great White Eyeliner, you’re sure to affect heart lines with bold, swoon-worthy eye makeup looks that stand out. What it is: Illumination Presents Dr. Seuss' The Grinch™ Grinch Stole My Look… a Color-Changing Skin-Perfecting Mask that helps purify and brighten the appearance of dull-looking skin by removing impurities in under 15 minutes. What it does: Change up your beauty routine with a Color-Changing Skin-Perfecting Mask and watch your mood soar! Inspired by Illumination’s sweeping new version of Dr. Seuss' The Grinch™, this peppermint-scented face mask is sure to help improve your mood — and the appearance of your skin — in just 15 color-changing minutes. Just-in-time for the holidays, this innovative Skin-Perfecting Face Mask is formulated with skin-nourishing Energy Complex and a hydrating combination of Sunflower Seed, Jojoba and Olive Oil that help moisturize the skin. Licorice and Sugarcane Extract work together to help purify and brighten the appearance of skin. As you massage it into your face, watch as this unique, feel-good, creamy face mask magically changes color from green to pink, so you know it’s working to thoroughly cleanse the skin of impurities for a renewed skin appearance that radiates! Increase your glow before a party, or do damage control when you arrive home — your skin will thank you! What it is: Illumination Presents Dr. Seuss' The Grinch™ Beware of Perfection—a 4-Piece Face Mask Sampler Gift Set that is specially formulated to target unique skin concerns by clarifying impurities and refreshing tired skin for a more youthful-looking appearance. What it does: This holiday season, vow to make time for yourself and indulge! Inspired by Illumination’s sweeping new version of Dr. Seuss' The Grinch™, this assorted 4-Piece Mask Sampler Gift Set is enriched with natural ingredients to help deliver a more youthful appearance that radiates. Replenish your skin, one mask at a time in under 16 minutes—or multi-mask and mix and match! Festively packaged in ornamental holiday bulbs, hydrating Soak It Up, Glitterally Gold Brightening Peel-Off Mask, Purple Pore Punisher and exfoliating Dirty Girl face mask each help cleanse, purify and hydrate dull, fatigued skin for transforming, lively results just-in-time for the holiday season. Gift this travel-friendly 4-Piece Mask Sampler Gift Set or pamper yourself and keep the invigorating face mask set for yourself. Find your new favorite or replenish… each face mask is specially formulated to target unique skin care concerns by clarifying impurities, refreshing tired skin, hydrating or firming the appearance of dehydrated skin for an easy at-home face treatment with little effort. Your friends and your skin will thank you! This collection is so pretty I love the look of everything it's very holiday-themed and I've been a huge fan of The Grinch. PUR knocked it out of the park with this collection and the packaging. I also have a couple of deals for you all in case you're wanting to snag this limited edition collection and save some money on your order. You can earn 7.5% Cash Back if you create a free account HERE you also earn some free money with new sign-ups, they also have a couple of codes to help you save even more on your purchase. You can earn up to 5% Cash Back if you create a free account with this site HERE you also earn some free money with new sign-ups, they also have over 18 codes you can pick from the save a ton of money on your purchases. I for one always try to save money and earn cash back on purchases because it adds up over time and is really nice when you shop online as much as I do. A couple of weeks ago, I was sent the Scary Green Werewolf Contact Lenses for testing and review purposes from My Scary Eyes. 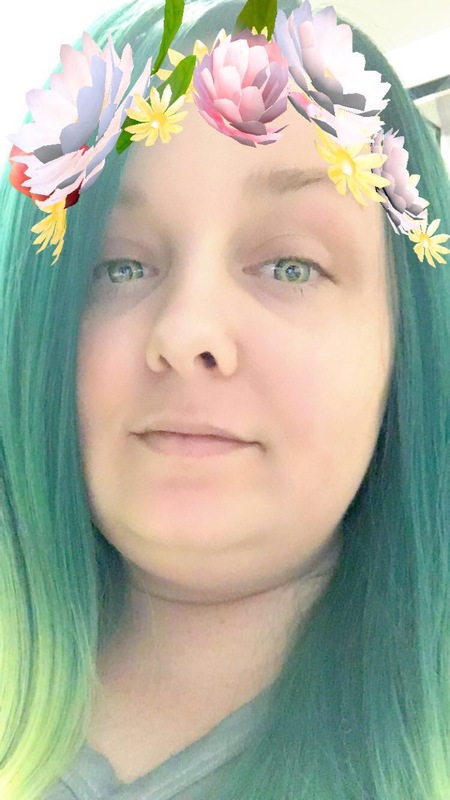 I was really excited because I knew these would be perfect for dozens of different looks, and that they would match my hair perfectly. The Scary Green Werewolf Contact Lenses are very comfortable t wear, and are even easier to apply. These can be worn for long periods of time, with no discomfort or drying out! I have sensitive eyes, and I experience zero irritation from these lenses. My Scary Eyes contact lenses are extremely oxygen permeable, basically, that means that they breathe great while on your eyes. My favorite aspect is the free shipping on all your orders! I feel like I’m far more inclined, to purchase from a company that offers free shipping. So don’t hesitate, stop by My Scary Eyes and pick up a pair of contacts, they have tons of different styles to choose from. They literally have a style of contact lenses for everyone, whether you prefer more natural colored lenses or bold colored lenses you can find something to meet your needs. I hope you all are having a fangtastic week! 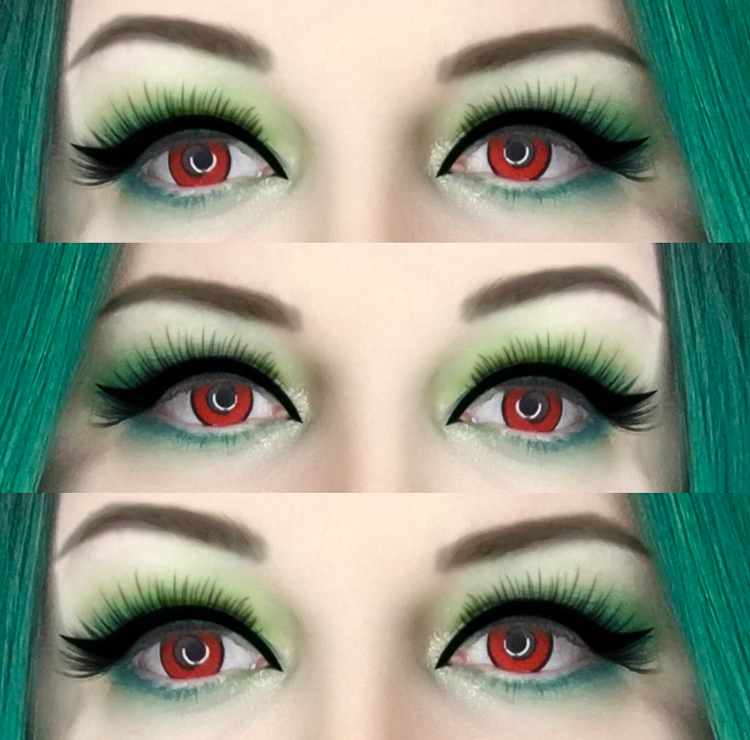 The Scary Green Werewolf Contact Lenses were sent to me by My Scary Eyes for testing and review purposes. All opinions are my own! Special thank you to My Scary Eyes, you guys rock! 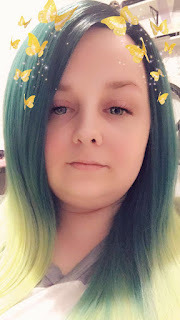 Hello, beauties stay spooky welcome back to my blog today I'm going to be reviewing a pair of contact lenses from My Scary Eyes in Voldemort Red. Below are a couple of videos where I'm wearing the lenses. Around a week ago, I was sent the Voldemort Red Contact Lenses by My Scary Eyes for testing and review purposes. I was thrilled when these arrived because I knew these would be perfect Halloween Contact Lenses for my Halloween makeup tutorials this year. I decided that I’m going as Bloody Mary. The Voldemort Red Contact Lenses were really comfortable for long time wear. I tested these out in my colorful summer themed makeup. I love the color, they’re such a brilliant shade of red these are definitely my new favorite! They can even be worn for long periods of time without any irritation! I tend to have hypersensitive eyes, and these don’t bother my eyes one bit. My Scary Eyes contacts seem to be very oxygen permeable so they breathe quite nicely. My favorite aspect of the company is, the free shipping on all of your orders! So don’t hesitate, stop by My Scary Eyes and pick up a pair of contacts, they have tons of different styles to choose from. They have everything from White Contacts, Cat Eye Contacts, Zombie Contact Lenses, & Color Contact Lenses. They literally have a style of contact lenses for everyone, whether you prefer more natural colored lenses or bold lenses you can find something to meet your needs. Don’t delay you don’t want to miss out on getting your My Scary Eyes contacts by Halloween so order today! The Voldemort Red Contact Lenses were sent to me by My Scary Eyes for testing and review purposes. All opinions are my own! How To Curl Your Brazillian Virgin Hair With A Straightener? The use of several hair extensions types has spread widely across the globe. Since its advent in the 1950s, the market for several hair extensions both synthetic and human has been on the rise. Millions of profits are made annually from the production and sale of hair extensions. There are several variations of human hair extensions ranging from the human hair, Brazilian Remy hair, Brazilian virgin hair, and several others. However, one of the most sought-after human hair extension is the Brazilian virgin hair. Known for its luscious and silky look, this hair extension is high on demand because of its durability, versatility, and uniqueness. While it is now readily available and can be purchased from online stores, not a lot of people understand how versatile this human hair is. The Brazillian virgin hair can be worn straight and curly no matter what texture it comes in. You do not necessarily need to visit a beauty parlor to achieve a different look while wearing this weave. Much like any other process, you would require some equipment. They are a professional flat iron, heat protectant, a detangling comb for parting your hair into sections, hairspray or a thermal heat spray. ●Detangling And Sectioning. This step can come before applying a heat protectant however, this step is important for achieving satisfactory results. Section your Brazilian virgin hair and comb through each section to achieve satisfactory detangling. After tending to a particular section, pin it up, and tend to another. ●Curl With Your Professional Flat Iron. After properly detangling each section, curl each one after another by placing it in your hair straightener. You can decide where you want your curls to begin and place your hair in the iron accordingly. You can experiment with different techniques either alternate flicks and curls or more making more pronounced curls. ●Flicks: To achieve curly hair using the flick technique, start halfway down the length of a section of your Brazilian virgin hair. Clamp the iron closed on the sectioned and turn it back on itself in a half turn. Slowly move it down the hair shaft to the end. ●Curls: For curls, start fairly close to the scalp and follow the same technique. Be careful not to burn the scalp. It is important to note that for both techniques, the slower you move the iron the fuller your curls are and vice verse. ●Pronounced Curls: For more pronounced curls instead of turning your flat iron halfway, make a full turn. This will cause the hair to loop on itself and produce tighter curls. For more texture and variation, you can decide to do one of the following. Change the size of each section, change the direction of curls, change the direction of curls close to your face, begin the curls at different parts of your section; close to your scalp or halfway through the section of your hair.